This is a 2 can set of Surface Primer interior dye for 70-92 Camaro and Trans Am. Primer is produced by SEM which is an excellent product and the only dye we use here both on our toys, and that of our clients. We redye roughly 2500 parts per year and have found SEM makes the best product on the market. SEM is not available everywhere so we offer these dye sets to our clients so you can achieve professional results at home! 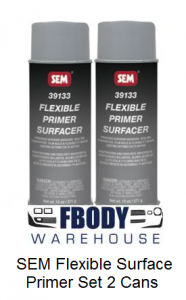 The surface primer can be used on metal, plastic or vinyl. It is used before the application of the SEM color coat. Once the color coat is applied to the interior panel, the clear coat is applied for durability. Please note dye can NOT ship air mail. Shipping times range from 5-14 days. GM Logo Replacment Floor Mats 4 pc Set Rubber Style 5 Colors Available!